Yes, the maps are legible but users might face readability issues while reading them at stations. Those issues are not errors, but are a result of contextual constraints. Readability is different from legibility. Readability depends on various factors such as typography, layout and context specific parameters such as viewing angle, viewing distance, and lighting conditions. To begin with, let’s understand readability and how is it different from legibility? Readability is the ease with which the user can read the text. It is distinguished from legibility which is a measure of how easily individual letters or characters can be distinguished from each other. Typographic decisions affect readability to a large extent. The typeface used, text size, letter spacing, line height, line spacing, and line length together determine the readability of the text. Since the map does not consist of sentences and paragraphs; line height, line spacing and line length are factors that do not hinder the readability of the map. The typeface used for the English MRM is Myriad Pro, which is regarded as an extremely legible typeface. Apart from these visual factors readability depends as much on the grammar and vocabulary used in the text. Since the MRM contains only the names of stations (no sentences, therefore no grammar), these factors also do not affect the readability of the map. Then what are the other factors that affect readability? The issue of readability of the map is context specific. Once the map is printed, mounted and installed at the stations, a whole new set of site specific factors begin to affect the readability of the map and these factors affect almost all print media displayed in public spaces. 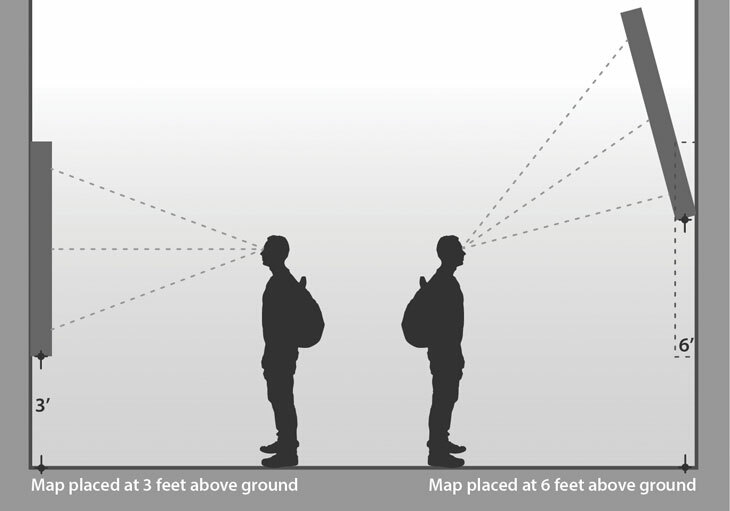 Viewing distance, viewing angle and lighting conditions at the location of installation are the different variables that affect readability of the maps at the stations. How do these factors affect readability? The installed maps have three hierarchical sections: (See Fig. 1). The proportion of the content on the display is governed by its relative importance. This implies that the content is organized in a hierarchy and there is a sequence in which the information must be accessed. Information makes sense to the user only when accessed in a meaningful order. 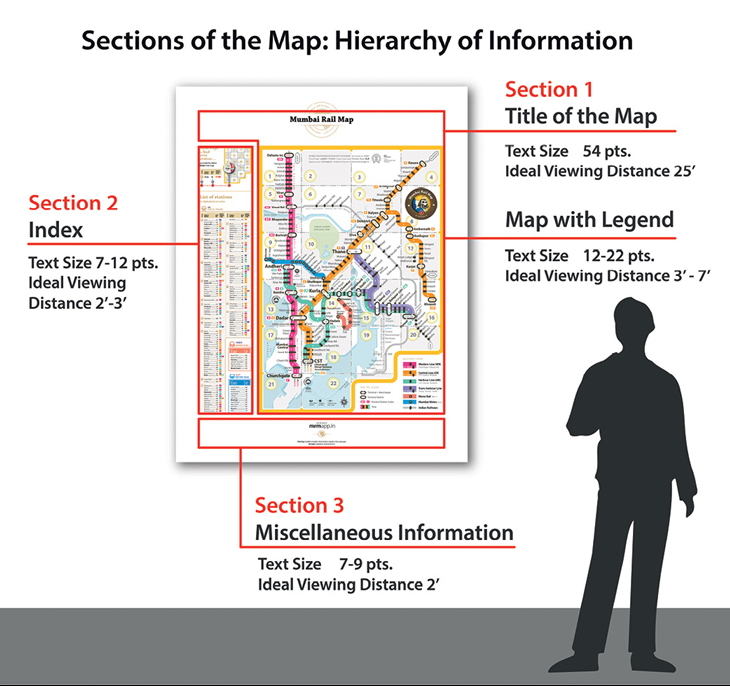 When a user is far away from the display, he must be able to read the title and see the map, which is why these are the most dominant sections (see Section 1 in Fig. 1). Once the user comes closer, he should be able to read the map and find his station using the index, which makes the index and instruction section relatively smaller. If he is interested in the miscellaneous information, he must move even closer to the map. Does this mean that the readability of each section is related with viewing distance? One of the primary factors affecting readability is text size. The text size in each of the sections of the map is determined by the sections’ relative importance, thus the size of the map title must be large enough to be read from a distance. 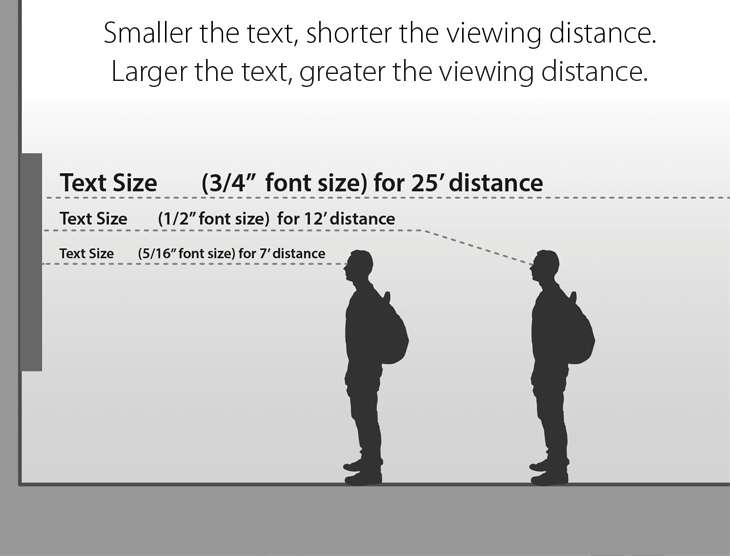 In figure 2 you can see the ideal viewing distances for the text sizes of the different sections. and as the size of the text increases the viewing distance can be greater. Image 1: Version 5 of MRM. Map has larger index and therefore is 6’ x 4’. Imagine three such maps, in English, Hindi and Marathi, side by side. How much area would that be? People ask us, “Don’t you think that the text size in the index is too small?”. In the earlier version (Version 5) of the map (see Image 1), the font size in the index was made larger. It therefore occupied the same space as the map. In this case, index can be viewed easily but the overall size of the map increases. According to government rules, it is mandatory that the maps are installed in three languages, English, Hindi and Marathi. That means that if each map is 6’ x 4’, the total space required for three maps would be 18 feet. This increases the cost and space required at stations. Moreover, our station layouts are not consistent. To find such a large display space that too at similar locations on all stations is not practical. Thus, version 6 of the map, which is 4’ x 5’, attempts to strike a balance between readability and practicality. Talking about practicality, how did we decide the positioning of the map at the stations? Size of the Version 6 of the MRM map is 4’ x 5’. The map should ideally be placed at 3 feet above the ground such that the centre of the map matches the average eye level of the Indian population. When the map is reachable it might be subject to graffiti and vandalism. 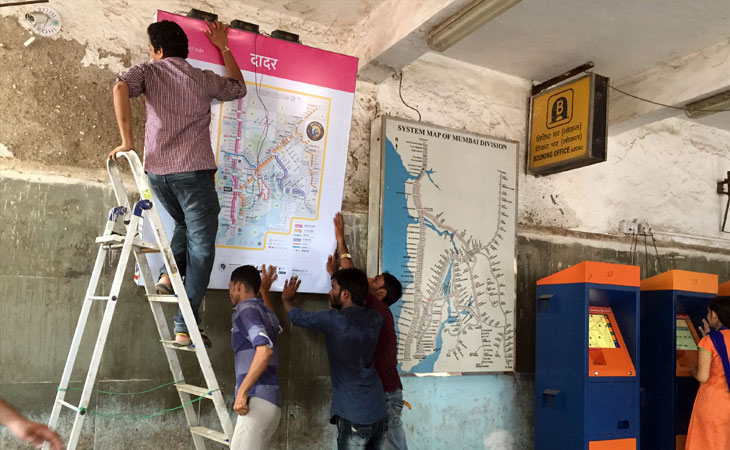 To prevent this we have positioned the map 6 feet above the ground at Dadar Station (Western Railway). When the height of the map is increased as you can see in Fig. 3, it goes beyond the comfortable viewing angle. Therefore the map should be slightly tilted to a degree that eases viewing which in turn increases readability. Fig 3: The map must be tilted to ease reading even when installed at a height. 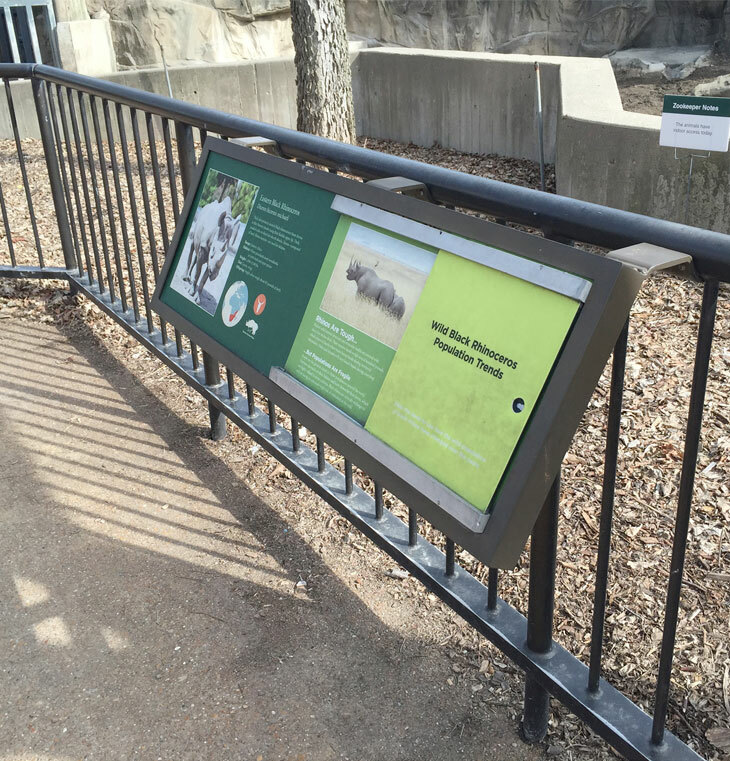 The information panels at the Chicago Zoo are an example of how tilting the display helps reading when the display cannot be installed at eye level. Image 2: Information display at the Chicago Zoo designed to cater to adults and children. See how tilting the display eases viewing across a range of eye-levels. How do the lighting conditions affect the readability of the map? The map, at present, is printed on flex and mounted on an aluminium frame. It uses LED lights for backlighting. This compensates for the non-uniform quality of light at stations. It also helps reduce glare for better readability. When we proposed the backlit map to Western Railways, the backlit panels had tube-lights. Meanwhile the government framed a new rule stating that all tube-lights in backlit displays should be replaced with LEDs. It saves 10% electricity as compared to tube lights, but when the flex is backlit with LED, the whole map gets a bit washed off (see Image 3). 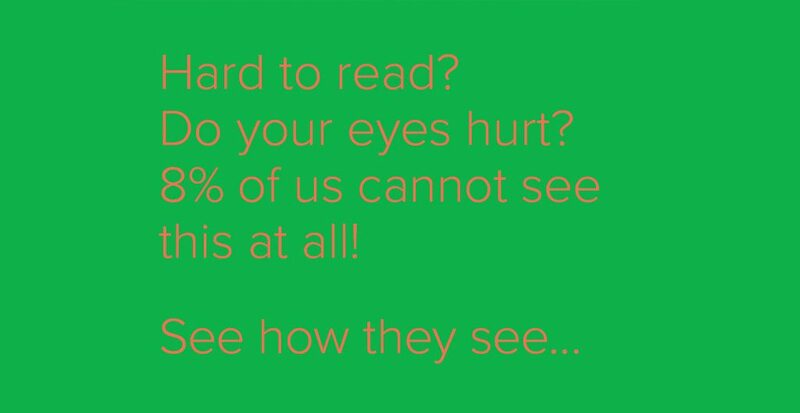 This brings us to another important factor that determines readability, contrast. Intensity of 100% black text is reduced to 80% grey, due to the extra brightness of LED (see the word Churchgate in Image 3). That means the 60% grey text goes for a toss and the pastel shades of line colors also get washed off. Therefore it affects readability when flex is lit by powerful LEDs. Advertisements do not face this issue as they have larger text and bold images when compared to a map. If this will be the final medium for displaying the maps, the artworks shall have to be altered to compensate for the reduced contrast or else the intensity of the LED lights should be reduced. Image 3: 100% black of ‘Churchgate’ in a backlit LED display is washed out to an 80% black. When contrast is high, readability is high.